State Animal - White-tailed Deer: The state animal was selected by a vote of Illinois schoolchildren in 1980. The white-tailed deer, (Odocoileus virginianus,) was selected from candidates nominated by the General Assembly and the Illinois State Museum. A bill was signed into law by Gov. James R. Thompson, effective Jan. 1, 1982. The deer, native to North America, has a gray coat that turns reddish brown in summer and an eye-catching tail that is bright white on the underside. Today the white-tailed deer is a familiar sight in most of Illinois. This has not always been the case; deer almost went extinct in the state. During the early 1800s deer were abundant throughout the state. Market hunting and drastic changes in land use during the 1800s led to the elimination of the native deer herds by about the beginning of the 1900s. Apparently, the last native deer was sighted in 1912 in southern Illinois. In Illinois' early days, Native Americans and Midwestern settlers relied heavily on the white-tailed deer for food and its hide for clothing and shelter. Interestingly enough, because of unregulated hunting in the mid to late 1800s, the white-tailed deer was nearly extirpated, that is, it had just about disappeared from Illinois completely. 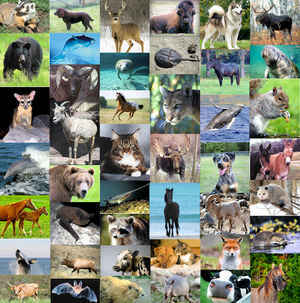 Years later, the Department of Conservation used careful management techniques and was able to bring the species back to abundance. The coat of the white-tailed deer is reddish-brown in summer and grayish-brown in winter. The belly, throat and areas around the mouth and nose of the deer are white. The tail, which the deer often raises as a warning for danger, also is white, giving the species its name. Young deer (fawns) less than 6 months old have white spots all over their coats. The average adult female at 1 year old is about 120 pounds while the male yearling weighs about 150 pounds. 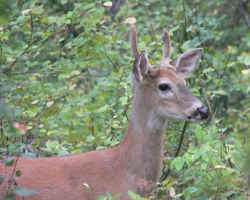 White-tailed deer live in forested areas, thickets and even suburban areas. 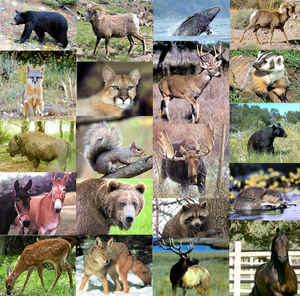 They eat a variety of plants including forest trees & shrubs, orchard trees, acorns, garden plants, soybeans, corn, wheat and rye. Male deer (bucks) grow antlers every spring. At first, antlers are covered with a velvety skin. By early fall this velvet has been rubbed off. After breeding, in December or January, the antlers fall off. The female (doe) gives birth to one to three fawns, usually in June. Odocoileus virginianus dorsal coloration differs in shading locally, seasonally, and among subspecies; however in general it is grayer in the winter and redder in the summer. White fur is located in a band behind the nose, in circles around the eyes, inside the ears, over the chin and throat, on the upper insides of the legs and beneath the tail. Whitetail deer have scent glands between the two parts of the hoof on all four feet, metatarsal glands on the outside of each hind leg, and a larger tarsal gland on the inside of each hind leg at the hock. Scent from these glands is used for intra-species communication and secretions become especially strong during the rutting season. Males possess antlers which are shed from January to March and grow out again in April or May, losing their velvet in August or September. 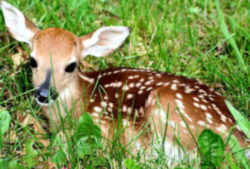 At birth, fawns are spotted with white in coloration and weight between 1.5 and 2.5 kg. Their coats become grayish lose their spots by their first winter. Whitetail deer have good eyesight and acute hearing, but depend mainly on their sense of smell to detect danger. 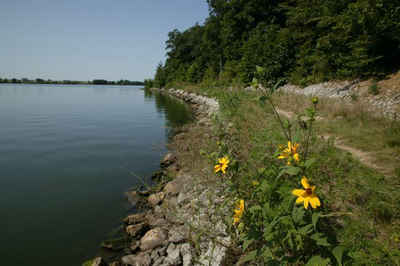 Whitetail deer are generally considered solitary, especially in summer. The basic social unit is a female and her fawns, although does have been observed to graze together in herds of up to hundreds of individuals. Females generally follow their mothers for about two years, but males leave the group within the first year. Bucks may form transient groups of 2-4 in the summer, but these disband prior to the mating season. Males begin rutting as early as September, and at this point become entirely preoccupied with obtaining mating. They do not guard harems (as with elk) but rather fight each other individually, clashing antlers to gain access to a particular female. Whitetail deer are able to survive in a variety of terrestrial habitats, from the big woods of northern Maine to the deep saw grass and hammock swamps of Florida. They also inhabit farmlands, brushy areas and such desolate areas of the west such as the cactus and thorn brush deserts of southern Texas and Mexico. Ideal whitetail deer habitat would contain dense thickets (in which to hide and move about) and edges (which furnish food). The law designating the white-tailed deer as the official Illinois state animal is found in the Illinois Compiled Statutes, Government, Chapter 5, Section 460/45.